Powered industrial equipment has greatly improved productivity in manufacturing, warehouse and distribution operations. Forklifts and hand trucks allow one employee to do the work of several in moving large quantities of materials and handling awkward loads. Storage space usage has improved due to palletizing and the ability to stack materials higher, utilizing more of the storage cube. While all these benefits have improved materials handling, the potential for serious injury and death has also increased. The sheer mass of a forklift can be equivalent to a full-size sedan, and although speeds are relatively low, because of that dense mass, the potential for accidents is a serious issue in the workplace. Fortunately, the frequency of accidents is fairly low – but when an accident does occur, it can have devastating results. Because of this potential for accidents and injuries in the workplace, it is important to institute safety measures regarding forklift operation and employee safety. 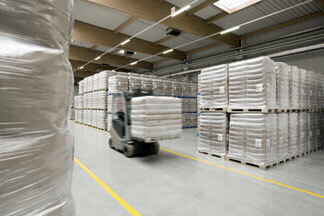 As you implement these safety measures, you will find that forklift safety is not just the operator’s responsibility. It also includes pedestrians entering and working in forklift traffic zones. All forklift operators in your facility should be required to follow some basic safety steps including doing a maintenance inspection each day. In addition to the daily safety checklist, operators are responsible for observing all facility safety rules regarding truck speed, right-of-way standards, and using defensive driving measures at all times. The operator has prime responsibility for preventing accidents and injuries at all times. Pedestrians may not completely understand their role in forklift safety. They may be unaware of forklift routes in a facility, the types of equipment used in the facility, and may disregard safety rules involving pedestrians. Each of these elements contributes to the number of collisions annually between pedestrians and forklifts, as seen in data from accident analysis. Correctly operating a forklift truck is only half of the equation that leads to safety in the workplace. The other half of the equation is pedestrian awareness and observation of all safety rules. Make sure all workers understand their responsibility in forklift safety. When both operators and pedestrians work together to increase safety, the health and well-being of all is safe guarded, and the workplace is a better environment for all.